A great way to relax and reconnect with your family or friends, this Pawna Lake camp offers a night of authentic camping experience. You can participate in a range of outdoor games with your fellow campers, from volleyball to archery. You'll feast on delicious BBQ snacks, grilled live at the campsite. In the evening, you'll gather around a crackling, yellow bonfire under the dark, night sky. After hours of fun, you'll have dinner and return to your tents pitched on the banks of the beautiful Pawna Lake. 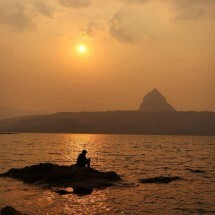 Located close to Lonavala, Pawna Lake is accessible via road with a 3-hr drive from Mumbai and Pune. The lake, flanked by the pinnacle of the Tung Fort on one side and sparse forests and mountains on the other, is a popular camping ground. Several nature and outdoor enthusiasts from Mumbai and Pune travel to Pawna Lake to spend the weekend away from the stress of the city life. 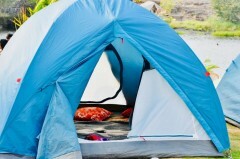 During the camping trip, you'll spend the night in tents that come equipped with sleeping bags, mattresses and blankets. You'll be served delicious meals including BBQ snacks, dinner and breakfast in the morning. • Go camping at this Pawna Lake camp. • Spend the night in tents pitched besides the Pawna Lake. • Feast on delicious meals, including grilled, BBQ snacks. • Catch spectacular views of countryside Maharashtra. Camping at Pawna Lake is a non-strenuous activity. However, if you have any cardiac or respiratory conditions, or suffer from knee or spinal problems, please consult your doctor before booking this trip. For cancellations made more than 2 days before check-in date of the Pawna Lake camp: 100% refund. For cancellations made less than 2 days before check-in date of the Pawna Lake camp: no refund. All refunds for cancellation of bookings for the Pawna Lake camp are processed after deducting a transaction fee of INR 200 per person. This fee is charged by The Great Next. Check-in time at the campsite is 16:00 hrs while check-out time is 11:00 hrs. Lake check-in can be permitted, however early check-in is not allowed. Transport between the campsite and Lonavala can be arranged for an additional cost of approximately INR 1,000 per jeep or car with a maximum capacity of 12 travellers, one-way. If you're travelling by your own vehicle, parking at the campsite is available. Bookings for children younger than 4 years are complimentary. Bookings for children between the ages of 4-12 years are charged at a discounted rate of 50%. Bookings for children older than 12 years are charged at full price. There is no pick-up for this Pawna Lake camp. There is no drop-off for this Pawna Lake camp. Day 1 of the Pawna Lake camp: Check-in and enjoy! Arrive at the campsite by 16:00 hrs. Once you reach, you can settle in to your tents and spend the rest of the day at leisure. You can participate in one of the several games and activities available at the campsite like archery, darts, cricket or volleyball. Once the sun sets, you'll enjoy some hot tea with pakoras and some BBQ snacks. Soon, a crackling bonfire will be lit and you'll spend the rest of the night having fun around the bonfire with your fellow campers. Overnight in tents at Pawna Lake campsite. Sitting on a rock, enjoy a golden sunset over the lake. Wake up to beautiful views of the Pawna Lake, right outside your tents. You'll check out of the campsite by 11:00 hrs. Your trip ends here. Beautiful sunrise over the lake. Overnight in tents at Pawna Lake campsite. Check-in time at the Pawna Lake campsite is 16:00 hrs. You'll be accommodated in twin, triple or quad-sharing tents that come with a foam mattresses, a sleeping bag, pillows and a blanket. The campsite has common washrooms. 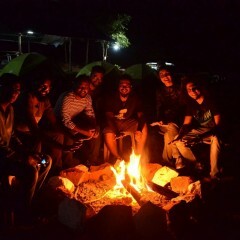 Today's meal plan includes evening tea/coffee with pakoras, BBQ snacks prepared at the campsite and dinner. The BBQ will be made from marinated paneer and chicken with assorted vegetables. Dinner will consist of paneer/chicken curry, chapatti, jeera rice and salad. Inside views of the tent. Your trip ends by 11:00 hrs. Today's meal package includes breakfast only. Breakfast consists of poha and omelette with tea/coffee. Check-out time at the Pawna Lake campsite is at 11:00 hrs. BBQ snacks, is your mouth watering already? 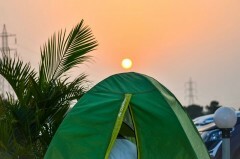 The campsite, located near Lonavala on the banks of the Pawna Lake, is accessible via road. You can drive your own vehicle or hire a private cab and travel to the campsite, located 3-hr drive from Mumbai and 2-hr drive from Pune.